PARKING NOT INCLUDED. $5.00 PARKING MUST BE PAID ON ARRIVAL. You must order your tickets ON OR BEFORE AUGUST 15 for gate admission to be included. You will receive one concert ticket and one gate admission ticket when you purchase on or before August 15. You will need to present the gate admission ticket at the entrance gate on the day of the concert you are attending and then present the concert ticket at the grandstand entrance. VALID ONLY FOR THE DATE OF THE CONCERT PERFORMANCE. If you order your tickets AFTER AUGUST 15 they will not include gate admission. This performance is Rain or Shine. Everyone must have a ticket. Seating is laid out exactly as it appears on the screen. 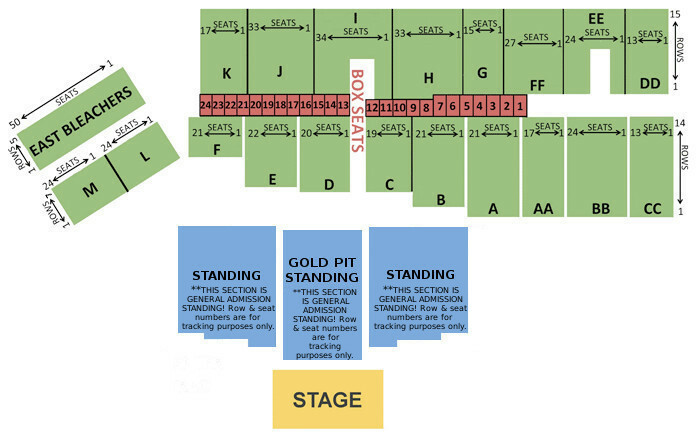 The Gold Pit Standing and Standing sections are "Standing Room Only". These sections are General Admission. For disabled seating, please call the Allegan County Fair box office at 269-673-6501. Children 5 and older are admitted into concerts with a ticket. Any child under 5 years of age are only allowed to attend shows specifically designed as family (such as Parade, Tractor Pulls, Rodeo, or Demo Derby) or children’s events, but must have a ticket to attend. Children ages 5-12 must be accompanied by an adult at the concert (adult must attend) and have a ticket. Ages 13 and above may attend without parent/guardian and must have a ticket. NO Chairs, Umbrellas, Coolers, Strollers, Backpacks, Weapons, Pets, Smoking (except in designated smoking area), Illegal Substances, Glass Containers, Audio or Visual Recording Equipment.